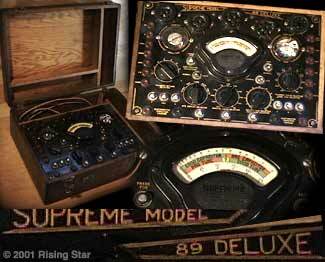 Vintage, Antique and Collectable Audio Equipment - Exciting rare finds! On this Page: Antique + Vintage Radios and Radio Equipment, Vintage Test Equipment and other Collectables. - Radio, Orignal Box + Power Eliminator! 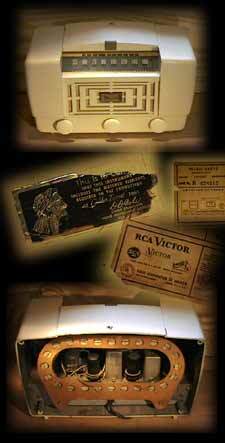 RCA Bakelite Radio Description: One of the finer radio models. Condition: Good working. I repaired this radio about a year ago. I replaced all capacitors in the Power supply and 2 more capacitors in the circuit. Deoxidized and lubricated switches and controls. This radio has a few scratches and dings. The most obvious is on top, center rear. Another is on the front, center pretty close to the metal center plate. Scratches are visible because the dark colored bakelite is painted a yellowish white (radio actually more yellow than web color scheme represents) there a few scratches, small dings, but no cracks, except on 2 of the controls mounting on the shaft. Out of one some material broke out (repaired with copper brace). The other control has a slight crack, but grips fine. The radio actually has a white rear cover which I took out for the photo to show you how it looks inside. The rear cover is mounted with 4 pins of which two are missing. At the bottom of the radio are 2 stickers: the golden throat sticker (damaged) and the model / warranty sticker. This one is well readable. Features: On/Off-Volume, tuning, tone: High/low, dial lights. 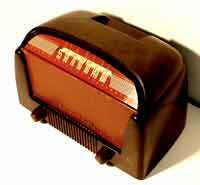 Description: This bakelite AM tube radio was made by Bendix Aiviation Corporation. The materials are bakelite and an alluminum face/speakr plate. This unit features a backlight dial. I repaired this radio reconditioned all contacts to be fully working. The unit works well and receives well. Then E-mail me your URL - and I will link back to your site and / or list you in my industry directory! Description: Here we have a rarety and special collectors item: A universal 6 transsitro radio in the white edition in near mint condition, it's original box, and a vintage battery eliminator, plus all paperwork! 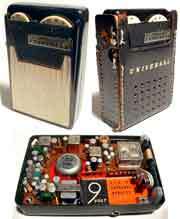 From the Days when Transistor radios still were specialty items and surprised with their small sizes. This unit was probably hand assembled and was made in Japan. It features 6 Germanium Transistors, a built-in speaker, a headphone jack and runs on a 9 Volt battery. Included is it's original leather case in perfect condiiton. Then there is another specialty item: The "battery eliminator", which is a tyny 110 V AC power supply in the size of a 9 V battery which allows to plug the radio in to standard AC power. There is also a special adapter included, which allows to recharge standard "dry cells" or for rechargeable batteries. The original paper work for both the radio, and the Battery eliminator are included. The radio comes with it's original box and the original battery that was supplied with this radio when first sold! (Battery is empty but physicaly in geat condition! Condition: All in great near mint condition with minor signs of age - items appear to not have had much use! I seriously doubt that you will find this exact radio in this condition with the supplied accessories anywhere else. Get is while still availalbe! As with al of my items: one of a kind and once sold: gone forever! Lot: 1 Vintage Universal 6 Transtor radio (white), 1 original leather case, I original box (top and bottom), 1 original owners manual for the radio (not shown), 1 original battery (when radio was first sold), 1 battery eliminator, 1 charging adapter, 1 original battery eliminator owners manual. Description: From the Days when Transistor radios still were a novelty and surprised with their small sizes. This unit was probably hand assembled and was made in Japan. 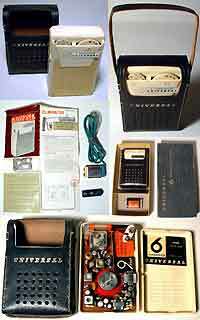 It features 6 Germanium Transistors, a built-in speaker, a headphone jack and runs on a 9 Volt battery. Included is it's original leather case (top is missing). An attention getting converstion piece! Lot: 1 Vintage Universal 6 Transtor radio, 1 original leather case. Get some vintage and antique looks, feels and smells for your place! Sold and shown in "As Found" condition, unless custom restoration is ordered. Description: Except for the last 2 radios shown, all radios availalble here have in common, that they are portable vaccum tube based radios. This means that they were designed and intended to be operated with batteries (requires a special high voltage battery no longer availalbe, but I can custom engineer a solution, if you want to pay for it). All radios also offer AC hook up through a provided a power chord, which is storred inside each unit. Originally I bought these radios to custom design a new product, but as life has it: It has been years and I have yet to get to it. So: either help me to find a low cost shop so that I can work without having the constant pressure of having to make lots money, which artificially inflated real estate prices, as brought on by the old boys who currently run the show, have brought to all of us, - or simply buy a truely vintage piece of American history in form of one of these tube radios! Theoretically I could also repair, re-work, or restore these vintage radios, but as my work aims at high-quality and is highly detail oriented, that would likely add about $150 to the price of one unit, thus these are sold "as found". almost all radios are complete and original, but very few have missing or replace, knobs, signs of use, cracks, tears and other imperfections as described - all in all for their age they are in good shape. What would you expect form 50+ year old equipment that has been used over the dacades? Due to age I would suspect that many capacitors, the power chords have to be replaced, and other work has to be performed, if wishing to operate these radios - but these radios, portable and small as they are, are also perfect in their current condition for decorative purposes! The actual items you will receive are shown here, as with all items on my web site, and if you spend more than $35 with me, I will be happy to e-mail high resolution images other than available from above. Other than that: these are sold at "as found" prices so that they may find a good new home. It takes a lot of time to photograph and to put it up here on the web, so please be kind with your critism of my prices - got to pay the banks. 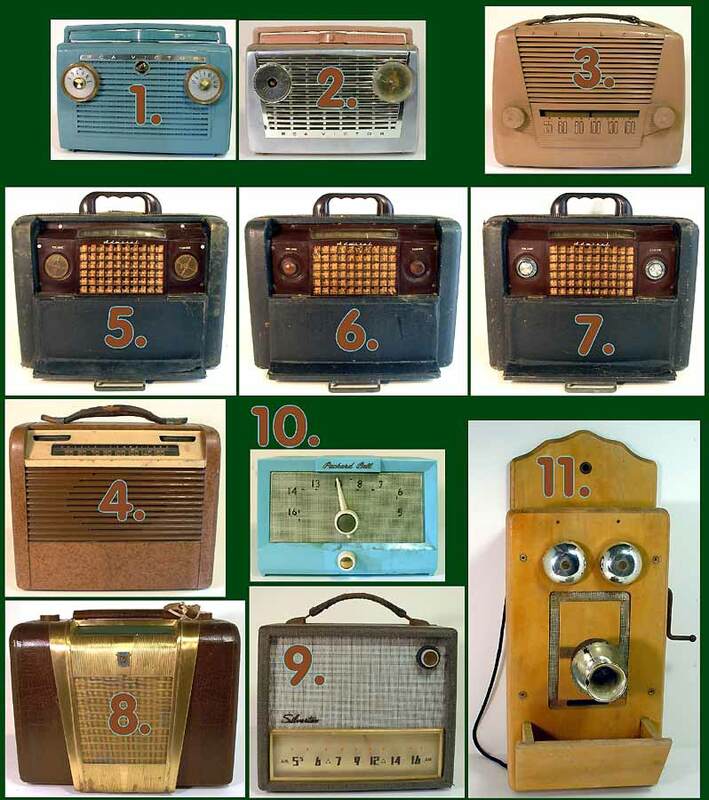 Radios of earlier Vintage below! Radio #11: Wall mount AC operated vaccum tube AM radio. Unknown make and model. From the days when weird stuff was tunred into radios in the 50's - telephone radio: the "bells" are the knobs: left: tuning, right: volume. Complete. Has AC power chord, intenral wire frame antenna, fullly tubed, Good physical condition. Description: This tube tester is from the times when resistors were hand wired and switches were made from laminated sheets screwed together. A piece of fine craftsmanship representing endless hours of tender loving labor to manufacture finest quality instruments. A true museums piece that could be yours. I was unable to find any information on this instrument and believe it to be rare. This is a piece of equipment encompassing the spirit of a magical time of mysterious inventions and exciting technology long gone. Lot: Tube tester in wooden case with all tubes in internal sockets, attached cables. Description: An antique radio collectors dream: In original as found condition - the dust of decades: untouched, not cleaned, not restorrred or tested in any way - old hay inside the unit - it came from a barn but appears to have been stored quite dry. This radio appears to be complete - no missing parts inside. This radio was designed to run on AC with an external speaker. On top of the radio is a typed sticker that says: Atwater Kent, 1929. Construction: Radio housed in a tin-can with removavble lids. Tubes: (Tubes dated with a little label each: AUG 23 1934), UX-280, UX-226 x 4, UX-227, CX-326. Radios of later Vintage above! Condition: As found with original dust from many decades. All tubes appear to be complete. Unit not tested in any way. 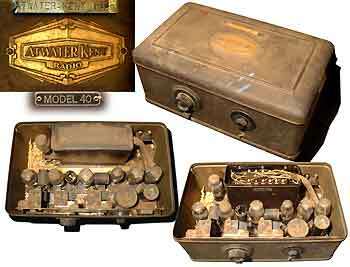 Lot: 1 Atwater Kent Model 40 Radio, tubed, as described and shown.